I find gift buying this day in age to be quite difficult and I always want to give a gift that is thoughtful, useful, education or an experience to remember. I've also recently been clearing out and trying live more simplistic to only have things in my home that are beautiful and useful. I want to clear space and have a home full of things I truly love. Experiences such as a massage, yoga class, cooking class or things such as epsom salts, candles or books are always top of my list. 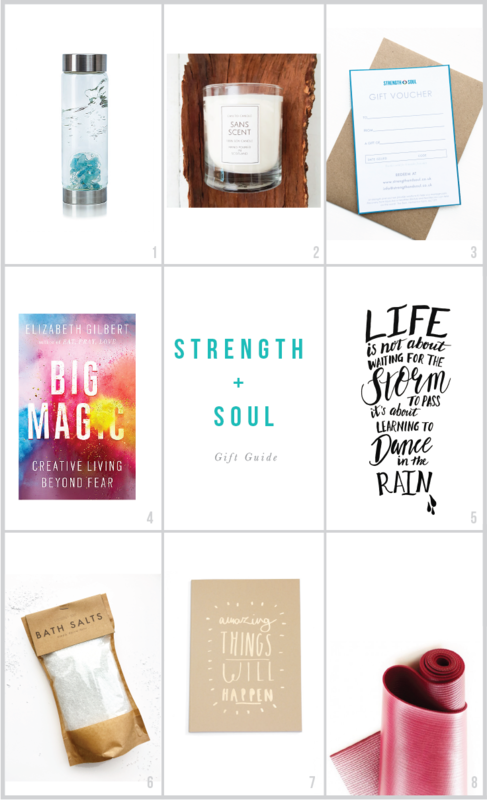 Here is a simple gift guide to help you find the perfect gift. Who doesn't love a candle - soy wax candle by Can to Candle. STRENGTH + SOUL Gift Voucher - we promise to give you an unforgettable experience! Books - learn, escape, be inspired. Who doesn't love a good book? Bath Salts, a great stalking filler - Now available at The Barn and online soon! We have gift voucher available online and at The Barn. Sign up to our newsletter to receive special offers.